Tender Notification for Supply, Installation Operation and Maintenance of Mushroom Food and Powder Production and Packaging Plant. Tender for Aluminium Partition works at various location at IGNTU Campus, Amarkantak M.P. Tender for Construction of Temporary Shed at Kendriya Vidalaya, IGNTU Campus, Amarkantak M.P. Two Week Capacity Building Programme for Young Social Science, Commerce and Management Faculty. Notice : Regarding E-KYC - All the SC/ST/OBC students are informed that please immediately submit the E-KYC along with Digital cast Certificate in the MP Scholarship Portal regarding MP Scholarship. All the SC/ST/OBC students are informed that please immediately submit the E-KYC along with Digital cast Certificate in the MP Scholarship Portal regarding MP Scholarship. National Seminar on Technology and Society in Central India on 1st-2nd March 2019 Organized by Department of History. 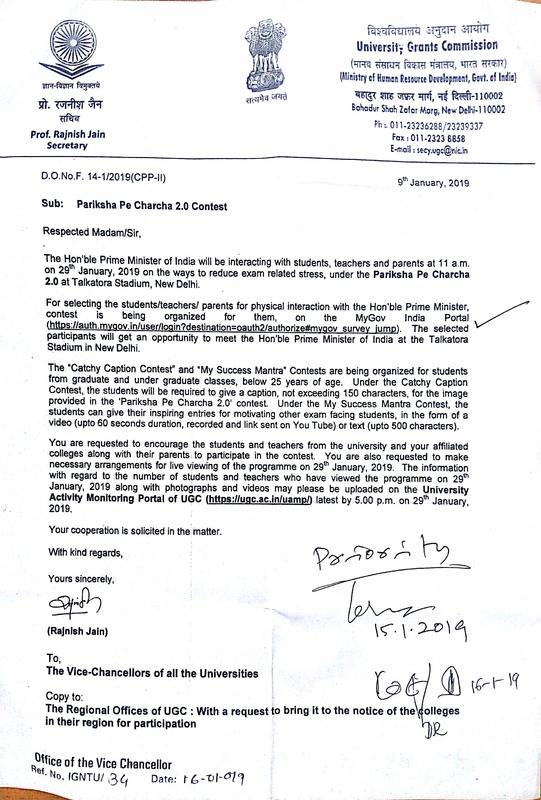 In terms of communication dated 15/01/2014 of MHRD, New Delhi and in accordance with the provisions given in Statute-2(4) of IGNTU, Amarkantak, Prof T.V. Katiimani shall continue in Office until further orders from MHRD, New Delhi. Tender No IGNTU/2018/PS/1267/Chapati Machine dated 27/11/2018 for supply and installation of Chapati Maker Machine is hereby treated as cancelled due to administrative reasons. Online Applications are invited for project based positions purely on temporary basis in the Centre of Excellence (supported by Min. of Tribal Affairs) to support and strengthen active research in the field of Tribal Development. 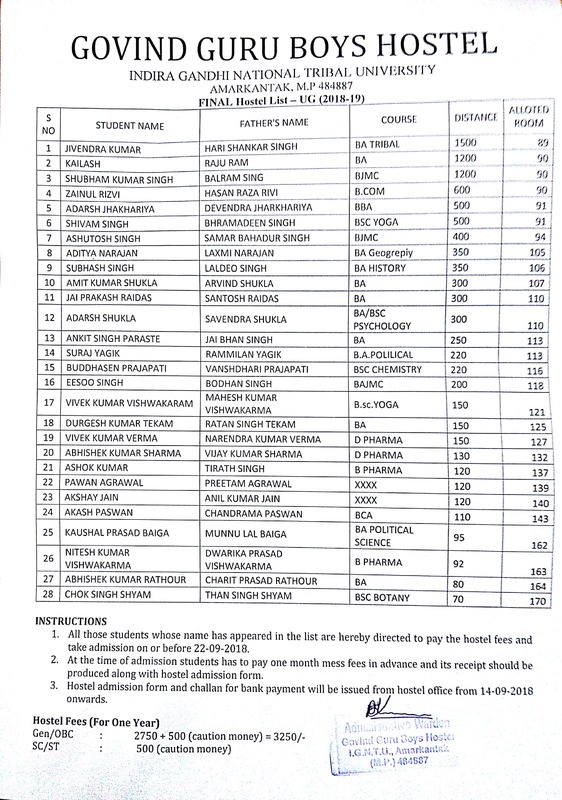 Final list of eligible and not eligible candidates after redressal of grievances for the project of Centre for Endangered Languages for the post of Assistant Professor (01-UR), Research Associate (01-UR) and Language Archivist and Documentation Officer (01-UR) on contract basis vide Advt. No. IGNTU/Rec.Cell/Cont/02/2018 dated 25/06/2018. Date of First Global Congress of Indigenous and Tribal Universities 2018 International conference has been postponed till further notice. Advertisement for recruitment of Teaching and Non-Teaching positions(temporary), for the IT for Masses Project. Applications are invited for the post of Research Assistant (01) in the Department of Education under the ICSSR funded Research Programme. The post is purely temporary and windup with the project. Applications are invited for the Post of Research Assistant (01-Open) in the Department of Tourism Management, Faculty of Commerce & Management, IGNTU, Amarkantak, M.P. under ICSSR funded Major Research Project. The post is purely temporary and wind up with the project. Date of Interview has been postponed. It will be held on 15.12.2018. Applications are invited from eligible candidates for one position of Junior Research Fellow (JRF) (01 post only) to work on a project sponsored by Department of Biotechnology, Government of India. Last date of submission of bid has been extended till 09.10.2018 upto 5:00 pm. RTI: Repeated, harassing RTI applications cannot be entertained. 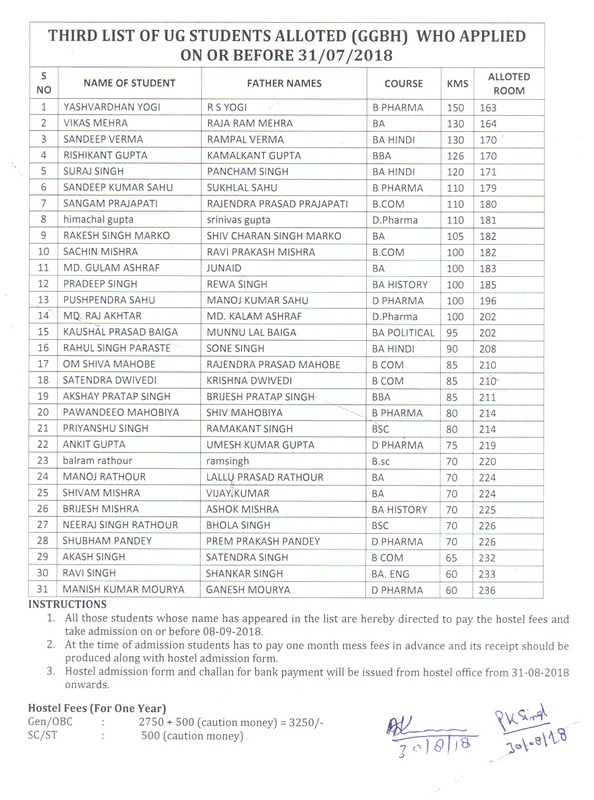 List of Eligible/Not-Eligible Candidates for the post of Librarian in IGNTU. Last date for Grievances is 27.09.2018. 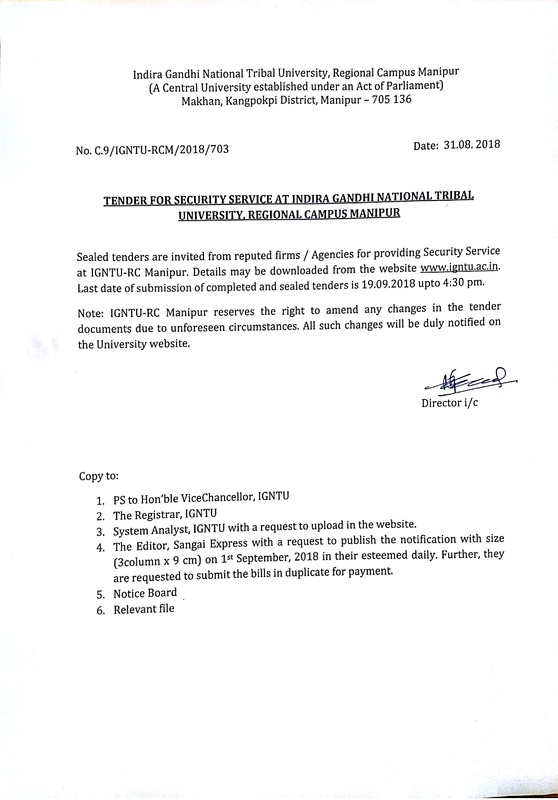 Interview date has been rescheduled on 08/10/2018 at 11:30 am. List of Eligible/Not-Eligible Candidates for the post of Medical Officer. Last date for Grievances is 13.09.2018. Applications are invited for Research Assistant (01) in a ICSSR funded project under Department of Education. Advertisement for the Post of Vice-Chancellor in IGNTU, Amarkanrak , M.P. Last date for Grievances is 31.08.2018. Applications are invited for Junior Research Fellow (01) and Animal Attendant (01) in a SERB funded project under Department of Zoology. List of Eligible/Not-Eligible Candidates for the post of Controller of Examinations (COE). Last date for Grievances is 22.08.2018. 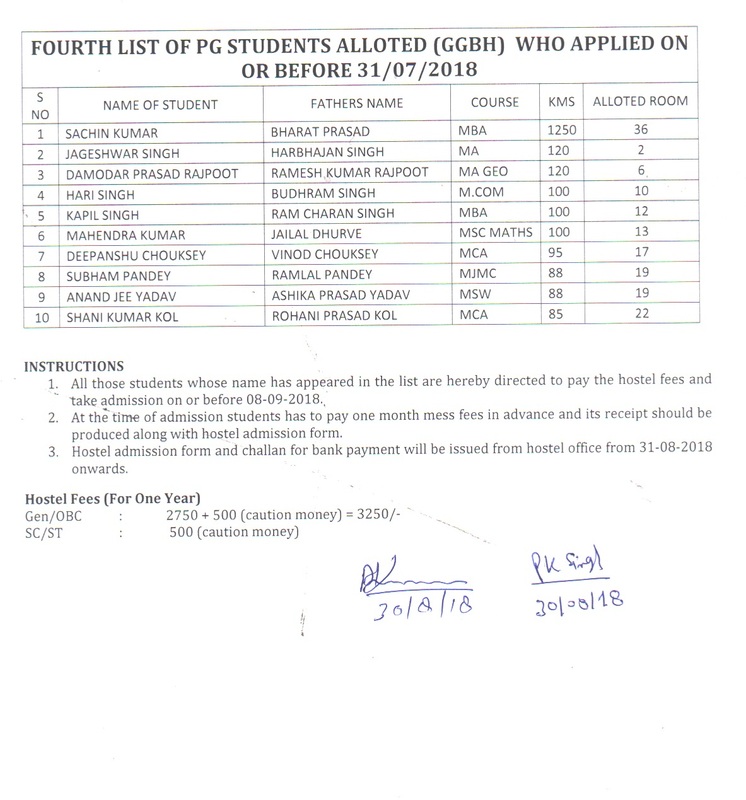 List of Eligible/Not-Eligible Candidates for the post of Farm Manager, Programme Assistant (Computer), Programme Assistant/Lab. Technician, Assistant in KVK Department and IAO. Last date for Grievances is 20.08.2018. All SC/ST/OBC Students of Chhattisgarh studying in IGNTU are hereby informed that Chhattisgarh Scholarship for SC/ST/OBC for the session 2017-18 has been started. Applications are invited for one position of Junior Research Fellow (JRF) (01 post only) to work on a project. Eligible candidates are required to appear walk-in-interview for the post of Officer on Special Duty (UR01) on contract basis in Indira Gandhi National Tribal University, Amarkantak, Madhya Pradesh. Last date is extended up to 31 August 2018 : Submission and Acceptance of Abstract. The Congress will provide the ideal opportunity to know the university model (mission, vision, organizational structure, student composition, syllabi, pedagogic methodologies, success rates, relations with the state/community/labor market, impact of university in local development, ethnic/cultural awareness and empowerment, etc.) and best practices report which can be used as a reference work for all the indigenous and Tribal universities in the world. One Day National Seminar on “Importance of Intellectual Property Rights in Innovation Management” on Thursday, 26th July 2018 at 11:00 am Indira Gandhi National Tribal University, campus Amarkantak, Madhya Pradesh. 2nd Phase Entrance exam for admission 2018-19 to B.A and M.A in Tribal studies, M.Sc in Statistics, M.A in Linguistics and B.Pharma (Lateral Entry) is scheduled on 22nd July 2018. Walk-in-interview on 01/08/2018 for purely temporary positions under LBI Training Center. University invites eligible candidates for a Walk-in-interview for filling up the following purely temporary positions under LBI Training Center. Online applications are invited from the eligible candidates for Teaching Post on Contact basis in Indira Gandhi National Tribal University (Main Campus at Amarkantak, Madhya Pradesh and Regional Campus at Manipur). Academic Calendar 2018-19 and Starting of Classes for newly admitted students: The classes for all the newly admitted students of UG (1st sem) and PG(1st sem) shall commence from 16/07/2018. Semester Admission Notification June-July 2018 for existing/old students. Last Date with late fee of Rs 100/- to pay the Semester Admission fee for UG,PG and PhD students is extended up to 20/07/2018. No more extension will be given. Applications are invited for the posts of Project Staff under the MPCST Funded projects at Department of Botany . University invites applications from bright and aspiring students for admission to PhD & Diploma programmes through an entrance examination . The Congress will provide the ideal opportunity to know the university model (mission, vision, organizational structure, student composition, syllabi, pedagogic methodologies, success rates, relations with the state/community/labor market, impact of university in local development, ethnic/cultural awareness and empowerment, etc.) and best practices report which can be used as a reference work for all the indigenous and Tribal universities in the world. University invites applications from bright and aspiring students for admission to some UG/PG programmes through an entrance examination . Inspire Free DST Science Internship Camp : Applications are invited for the Inspire Free DST Science Internship Camp. The camp shall be held from July 06-10, 2018 at IGNTU, Amarkantak. IGNTU is inviting Expression of interest from suppliers/venders/firms those have proven track record of installing retro reflective sign boards. Online applications are invited from the candidates for Medical Officer (01-UR) in Indira Gandhi National Tribal University, Amarkantak, Madhya Pradesh. Eligible Candidates should fill Online Application through IGNTU website http://igntu.ac.in/recruitment.aspx. The Opening date of online application is 11.06.2018. The closing date for submission of online application is 10.07.2018 and submission of hardcopy of application along with self attested enclosures (by Speed Post or Registered Post only) is 20.07.2018. Applications are invited for the posts of Junior Research Fellow under the MPCST Funded projects. Project title: "Recognition of anionic pollutants using tetrazole containing abiotic Receptors"
Online applications are invited from the candidates for Librarian (1-UR), Controller of Examinations (1-UR) and Director RCM (1-UR) Eligible Candidates should fill Online Application through IGNTU website http://igntu.ac.in/recruitment.aspx. The Opening date of online application is 23.05.2018. The closing date for submission of online application is 23.06.2018 and submission of hard copy of application along with self-attested enclosures (by Speed Post or Registered Post only) is 05.07.2018. Online applications are invited from the candidates for Internal Audit Officer (on Deputation / Contractual). Eligible Candidates should fill Online Application through IGNTU website http://igntu.ac.in/recruitment.aspx. The Opening date of online registration is 23.05.2018. The closing date for submission of online application is 23.06.2018 and submission of hardcopy of application along with self attested enclosures (by Speed Post or Registered Post only) is 05.07.2018. Notice : English Compulsory Back Paper is scheduled on 27/05/2018. The Semester end exam paper of English Compulsory Back Paper is scheduled on 27/05/2018. Ministry of Electronics and Information Technology (Government of India) Electronics Niketan, 6, CGO Complex, Lodhi Road, New Delhi - 110003. Starting date to download the Admit Crad/ Hall Ticket is : 25/04/2018. The Students of all UG, Integrated, PG and PG Diploma Programmes are hereby informed to pay semester end exam fee through online. Withholding of Advertisement No. : IGNTU/ Rec. Cell/ T-01/2018 dated 08.04.2018 (for various teaching positions) till further Notification. Eklavaya Kindergarten School invites applications from all eligible candidates on purely temporary/part time on contractual basis. Online applications are invited in the prescribed application from the eligible candidates for the following posts at Krishi Vigyan Kendra (KVK) under ICAR project in Indira Gandhi National Tribal University, Amarkantak, Madhya Pradesh. Call for Proposal to submit EoI (Expression of Interest) for developing software on an Automation of IGNTU Examination Section. 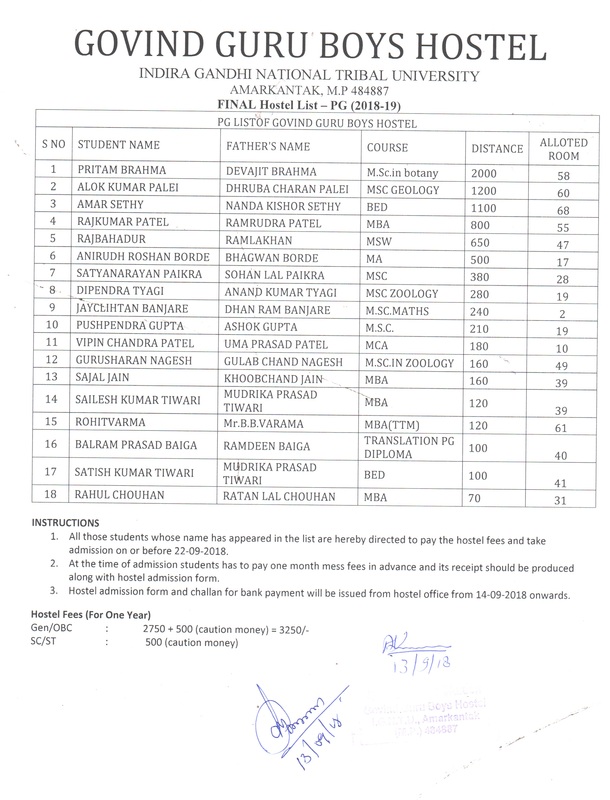 Data of Institute of IGNTU Department and Course Code for Scholarship.